Artists in the UAE are calling people to visit a new online exhibition to expose themselves to the plight and success of Muslim women around the world, and challenge common stereotypes. 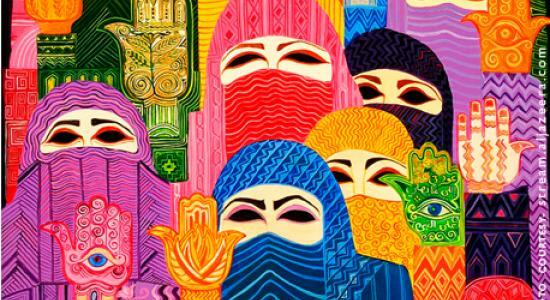 Artist and University of Sharjah College of Fine Arts and Design lecturer Dr Fatima Zahra Hassan said Emirati women, in particular, should view a new online exhibition (http://muslima.imow.org) showcasing the stories of Muslim women from around the world. Hassan is one of the three Sharjah-based artists featuring on Muslima: Muslim Women’s Arts and Voices, which is a global online exhibition from the International Museum of Women, incorporating art and the written word to explore identity and break stereotypes. Originally from Pakistan, Hassan trained at the London Royal College in Indo-Islamic, Mughal and Persian Painting techniques, with an emphasis on Art of Book. Hassan, Sharjah-based painter Haafiza Sayed and writer Dalia Merzaban will be holding workshops about their crafts and how their art forms have helped develop their identity, followed by a panel discussion, “How do you know who I am”, at the Sharjah Museum of Islamic Civilisation today. Hassan added the exhibition had really opened her own eyes up to both positive and negative aspects of being a Muslim woman.“The texts, images and photos were really overwhelming. Hassan has done a lot of voluntary work in Pakistan and the UK, including in flood refugee camps with women and children. Despite the perception that art was not a career, meaning many creatives here went into interior design, multimedia or graphic design instead, there were a growing number of female Arab artists coming through, she said. However, not many newer Emirati artists were dealing with women’s issues. “Because most of these women are coming from privileged backgrounds so they can’t think of issues, apart from being more free and independent … they have got everything. She got involved because it was a chance to challenge recognized stereotypes associated with Muslim women. Sayed will be talking at the workshop about how she found herself through art. After “getting lost” and losing the will to paint following her formal training, she became an interior designer and only years later picked up the paintbrush again, determined to ‘unlearn’ what she knew, and rediscover her own style.